A dear reader of this blog had requested the recipe of Doli ki roti long back and I had been planning to post the recipe since then. I made doli ki roti a few times since then but could not click pictures as it was either made for dinner or for a gathering where serving the roti hot out of the pan is priority and clicking pictures doesn't come in the way. And then I heard Babso Kanwar and Pushpesh Pant talking about Doli ki roti at Oberoi Gurgaon when Lost recipes of India were being showcased. I got to know that doli ki roti is available somewhere in Multani Dhanda in Delhi, I am yet to visit Multani Dhanda to taste the doli ki roti but there is so much more to doli ki roti than just the taste and texture. This doli ki roti is actually a deep fried flat bread made using 'sourdough leavened dough' but it is very different from kulcha or bhatoora. 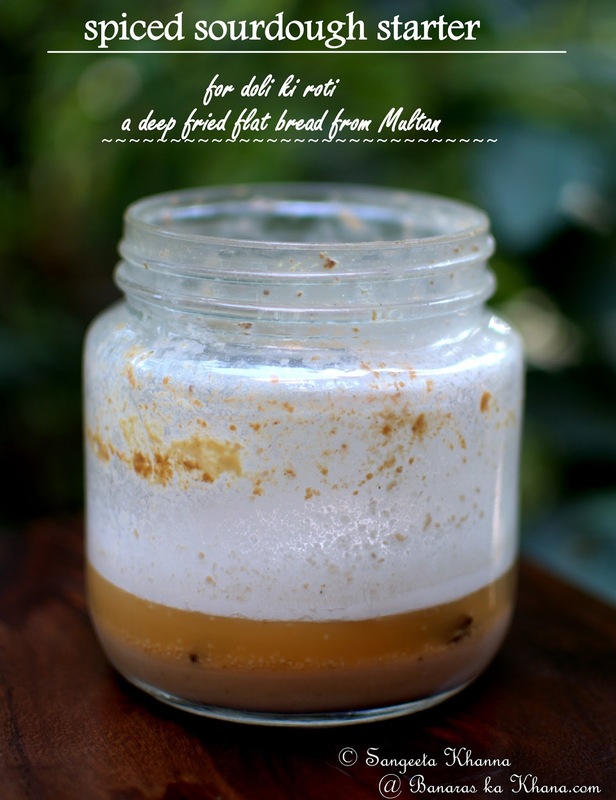 The taste is complex and aromatic because of the use of spices in the sourdough starter. It will be good to recount that all breads in the Multan and Punjab region were made using leavened dough in the past and that too in a community tandoor called sanjha chulha. Women in rural Punjab would gather at this community tandoor to make their everyday rotis. The fried variations of the bread will be cooked at home of course. The use of sourdough in everyday roti was a norm in Punjab, Multan of undivided India and Himachal which was part of Punjab in older days. The sourdough was called 'khatta' and a small piece of dough was reserved from the previous day, to be added to the fresh dough which was rested for a couple of hours before making fresh rotis. This sourdough fermentation ensured lower the amount of phytic acid (study) in all these breads and added many more micro nutrients to it, though the people might have been unaware of this fact. But it is a fact that dietary habits and procedures evolve in a specific way, in the direction of well-being. Positive effects on health will be noticed sooner or later and the foods that cause well-being will be continued and those causing harm will be discarded. To make doli ki roti the sourdough was prepared in a special way, using spices and poppy seeds along with jaggery for added flavours. This sourdough starter was shared with extended family and friends too. The use of spice definitely discourages rotting of the prepared bread for longer duration because spices are naturally antimicrobial. Imagine how much antioxidants were added to the bread through the spices. I noticed that this spiced sourdough is quite stable at room temperature. This jar of the sourdough is a month old and has not been fed since it was fermented for the first time using the spices. Half of it was used for making doli ki roti and the other half was fed a month later. It revived beautifully. Read about a regular sourdough here. Doli ki roti was named so because the roti keeps well for 3-4 days and used to be great as a traveling food. It was probably packed with the just married daughter along with her doli, a palanquin in which the married couple used to be carried to the groom's home. 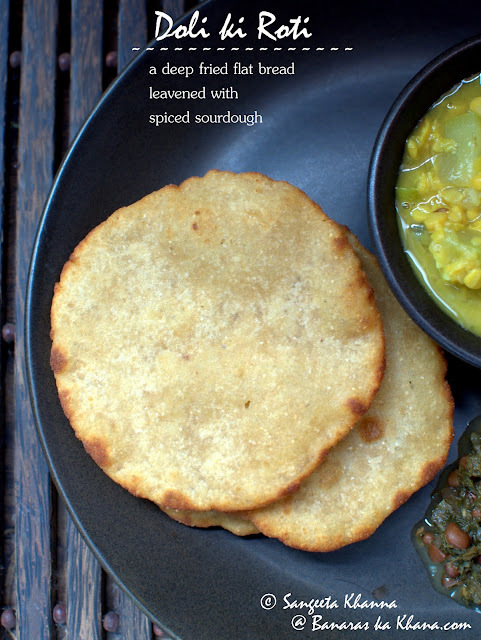 A blogger friend Alka Keswani says it was named as doli ki roti because the fermented sour dough was prepared in a vessel called Dol. Evidently, making sourdough was an art perfected quite well by people eating wheat in this country. My recipe is based on the doli ki roti that my friend used to share with us whenever this roti was made at her home. Her family was from Multan, settled down in Banaras, they have a carpet export business based in Bhadohi. Usually whole spices are boiled in water for sometime and I used to do that earlier, now I just add powdered spices to hot water to make it wasy. There is no change of taste. Everything is mixed together and kept in a glass jar with loosely fitted lid. I needed to keep it for 2 days before I could see bubbles. Then I added 1/4 cup of whole wheat flour and whisked once. Again the jar was closed and kept for 2 days. It smelled divine by this time, the yeast and the spices make some magic in this spiced sourdough. Note that this sourdough keeps well on room temperature for about a month. You can make a large batch of this sourdough to keep making doli ki roti frequently. ingredients and procedure to make the doli ki roti..
For about 10 small doli ki roti I used half of this starter and 1.5 cups of whole wheat flour. Knead a plaible dough using some more warm water and let the dough rest for 2 hours at least or till it doubles in volume. 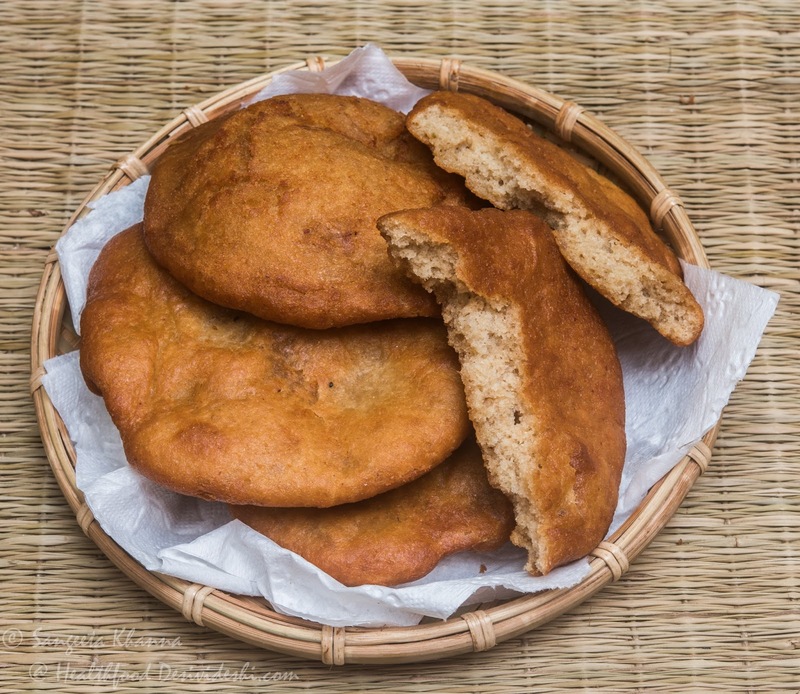 Now heat up ghee or oil in a kadhai and fry thick pooris using this dough. Usually the thick pooris are patted on the palms but you can roll them out on a rolling board. Deep fry till golden brown on both sides and serve with any curry you like. We enjoyed the doli ki roti with lauki chane ki daal and lobiya wala sarson ka saag this time and this meal was quite heavy I must add. 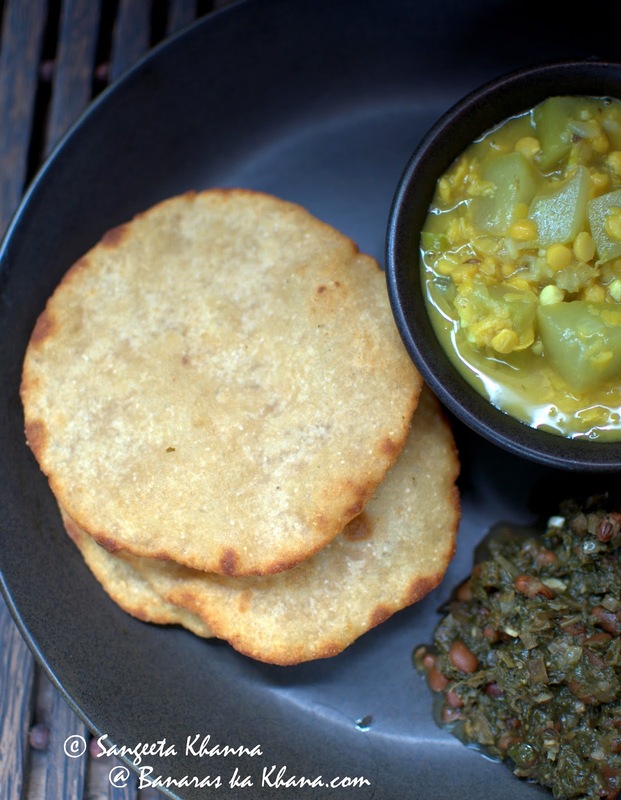 This is plain doli ki roti but another richer version has a chana daal stuffing in it. My friend's mother used to knead the dough with some soaked chana daal so the doli ki roti had some chana daal studded in it. That made the bread almost like a full meal in itself. Try making doli ki roti if you like deep fried food or you want to relive a tradition that is rarely seen now. It might not be a lost recipe but I don't see people around me making it often, though bhatoora is very commonly made and enjoyed and has even become the most popular Delhi street food. I need to go to Multani Dhanda now. do you add yeast at all? Asking since it is not there in the list. Hi Chatty wren. There is no yeast used in the recipe. The sourdough harvests wild yeast strains from the atmosphere and from the surface of grains and flours and the resting time of the sourdough ensures active wild yeast to revive for leavening of the bread. Is the Doli ki Roti supposed to be made only during summer months? Thanks maria. This is quite interesting. Multani doli roti seems to be a different bread and the only similarity is the sourdough?